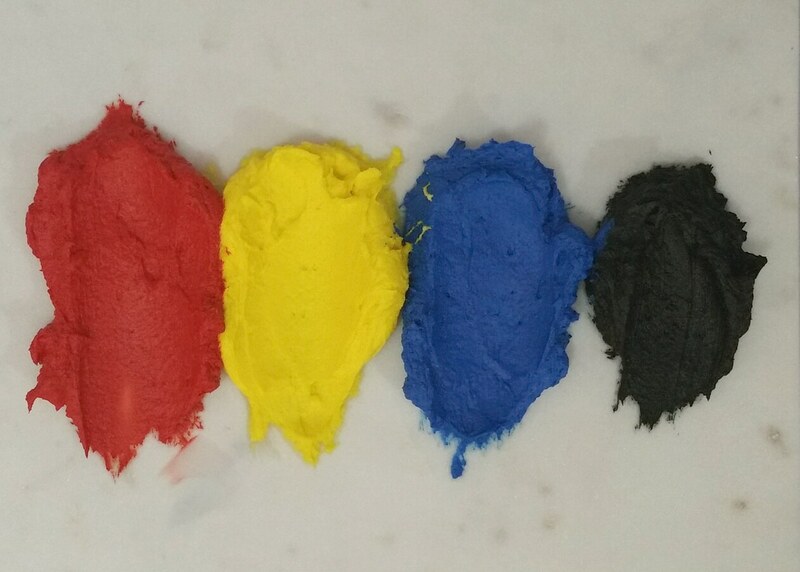 Trying to colour your meringue-based buttercream but finding it doesn’t take on colour that well? It’s easy enough to achieve pastels, but when it comes time to trying to achieve a deep, vibrant colour, I’ve been frazzled by how much gel colour I’ve added and still not getting the results I was looking for. One approach is to colour your meringue before you add your butter. Butter being high in fat, it does not take on gel colours well (water based colour + fat = no go). So, if you colour your meringue first, before emulsifying in the butter, you will have better success with it. But, when wanting to save on time, you may want to make a big batch of buttercream, then split it up to colour separately. And I honestly thought that it was impossible. I’d tried using flo-coat mixed with gel colours (fail), and used oil based colours as well (another fail) . I had all but given up – that is, until I learnt about the “blooming” method – and let me tell you, it’s been a game-changer. Red – Start off with Deep Pink until deep pink is achieved, then tone to red using Super Red. Pink seems to colour easier than red, so overall you would be using less colouring. Blue – Start off with Electric Blue until a deep blue, then tone using Royal Blue. Black – Start off by adding cocoa powder and/or melted dark chocolate to get a chocolate buttercream colour (it’s better to start with a darker base, that way less colouring is used), then tone to black using Super Black. Prepare your buttercream as usual, and set aside whatever portion you want to colour. From the portion you want to colour, scoop out 1/4 cup of it into a microwave safe cup/bowl. Add several drops of gel color and stir well. Microwave it until it is melted (usually about 10 seconds) – you will find that the colour will have darkened significantly. Then mix this “bloomed” colour into the rest of the batch in the mixer, bit by bit, until you like the color. If you need to darken further, repeat the process and add more colour. (Try to avoid repeating too often, or you may compromise the texture of your buttercream. If it does start going too soft, you’ll have to fridge it for, say, 15 minutes at a time and remix, until it becomes firmer again). Be mindful – colours darken with time! I tend to leave the coloured buttercream to develop at least 4 hours (overnight is best). The colours above, for example, I stopped adding to the red when it was at a coral red colour; the black was more of a dark charcoal colour when I stopped adding colour. The colour then further developed overnight to achieve those pictured results.